"Wherefore, my beloved, as ye have always obeyed, not as in my presence only, but now much more in my absence, work out your own salvation with fear and trembling. For it is God which worketh in you both to will and to do of his good pleasure. Do all things without murmurings and disputings: That ye may be blameless and harmless, the sons of God, without rebuke, in the midst of a crooked and perverse nation, among whom ye shine as lights in the world; Holding forth the word of life; that I may rejoice in the day of Christ, that I have not run in vain, neither laboured in vain." Carnality is described by GotQuestions as being translated from a Greek word that means “worldly” or “fleshly.” In other words, carnality involves worldliness and a giving in to fleshly appetites. When we put our faith in Jesus Christ we become born again of the Spirit of God. Old things are passed away, behold all things become new. We are a new creation in Christ...given a new nature, the nature of God. Romans 13:14 tells us, "But put ye on the Lord Jesus Christ, and make not provision for the flesh, to fulfil the lusts thereof." In fact the entire chapter of Romans 13 instructs the believer how they ought to be living daily...and especially in the last days! If Godly character is the result of the Holy Spirit’s work of sanctification in our lives, why is it that we can hardly tell the Church from the world today? I love the way GotQuestions puts it, "Character in the believer is a consistent manifestation of Jesus in his life. It is the purity of heart that God gives becoming purity in action. God sometimes uses trials to strengthen character: “we also rejoice in our sufferings, because we know that suffering produces perseverance; perseverance, character; and character, hope” (Romans 5:3-4). The Lord is pleased when His children grow in character. “You test the heart and are pleased with integrity” (1 Chronicles 29:17; see also Psalm 15:1-2). We can develop character by controlling our thoughts (Philippians 4:8), practicing Christian virtues (2 Peter 1:5-6), guarding our hearts (Proverbs 4:23; Matthew 15:18-20), and keeping good company (1 Corinthians 15:33). Men and women of character will set a good example for others to follow, and their godly reputation will be evident to all (Titus 2:7-8)." Selfishness, compromise and carnal living slows the sanctification process until the believer's heart waxes cold towards the Lord. Once the heart waxes cold, the believer becomes mechanical in his devotion to God, ritualism thus replaces relationship and this is a very dangerous thing. Has your love for God grown cold? There are plenty of warnings in scripture about this, and in the book of Revelation we see the Lord's rebuke of the Church at Ephesus for their love growing cold. Rev 2:4-5, "Nevertheless I have this against you, that you have left your first love. Remember therefore from where you have fallen; repent and do the first works, or else I will come to you quickly and remove your lampstand from its place—unless you repent." 1. HATE EVIL AND LOVE GOOD. "Seek good, and not evil, that ye may live: and so the Lord, the God of hosts, shall be with you, as ye have spoken. Hate the evil, and love the good, and establish judgment in the gate: it may be that the Lord God of hosts will be gracious unto the remnant of Joseph." (Amos 5:14-15). 2. DON'T LET BAD COMPANY CORRUPT YOUR CHARACTER. "Be not deceived: evil communications corrupt good manners." (1 Corinthians 15:33). "And not only so, but we glory in tribulations also: knowing that tribulation worketh patience; And patience, experience; and experience, hope" (Romans 5:3-4). As we consider the various problem areas and challenges facing us in the last days and realize how formidable the foe is, what can we do to ensure that we stand in the last days? We shall now consider certain broad areas of emphasis that may be helpful for us to take note of, as we earnestly desire not to fail the Lord during such a time. The one area we need to pay heed to and to develop is our CHARACTER. We need to nurture our character to be like that of the Lord Jesus. As we do this, we would find that God's values become more and more our own, and we begin to love what the Lord loves and seek to uphold what is upon the heart of God. No longer do we give room to dishonesty to become rich and famous, in fact, no longer do we even desire to be rich and famous. What we begin to long for is to be what the Lord desires us to be. We do not have to struggle to hang on to what we recognize to be sound biblical principles and moral values. Instead, these very principles and moral values become integrated and incorporated into our very beings. In other words, we no longer need to strive so very hard to be godly; godliness becomes part and parcel of our lives. Desiring and defending godly principles and truths become a spontaneous outflow of our lives, and living pure and holy lives become as natural and as unsurprising as breathing in and breathing out air in the physical realm. This seems rather hard to imagine and yet it is feasible for a child of God to attain. God has given ample resources for His children to grow into godliness such that His children would be conformed to the image of His only begotten Son. With such a character, the influence of the world and the lust of the flesh will not be able to affect the lives of God's people to any significant degree. They become, as it were, "immune" to the contamination and "infection" of the world system. The world and its values then become an abomination, something detestable and undesirable. God's people, in such a state and with such a character, can see right through the system of the world. They perceive its ugliness, its deception and its lies and they are then able to keep themselves unblemished. Nurturing a godly character is a process, a building process in fact, and it takes time and diligence. We see the apostle Peter referring to this in 2 Peter 1:4-11. Notice in particular some of the practical steps needed. "Now for this very reason also, applying all diligence, in your faith supply moral excellence...knowledge…" (2 Peter 1:5). What is clear is that a great deal of diligence is required on the part of the believer. It is not a process that takes place automatically. It requires much hard work and it is something deliberate. The believer, in his faith, applying all diligence is to supply all these various virtues, leading to godliness, brotherly kindness and love. Our faith is to be characterised by moral excellence, knowledge, self-control, perseverance, godliness, brotherly kindness and love, all demonstrating various aspects of the divine nature. We are to be partakers of the divine nature, manifesting traits and aspects of God's own attributes and nature. This is our high calling and we are to work hard to achieve this. It is helpful here to distinguish between "character" and "gifts." 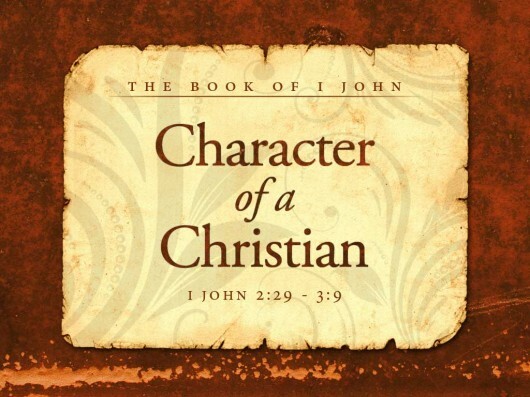 "Character" is part and parcel of the being of the believer and it is realized through transformation of life as the believer co-operates with the Holy Spirit of God. "Gifts" may be bestowed by the Holy Spirit in the life of believers for specific functions and roles. They may also be removed, should the Lord see it fit to do so. In 2 Peter 1:8, Peter made mention of these virtues as increasing. It is not something stagnant; it is dynamic and growing. There are various depths that we can grow into and experience by God's grace. And if this is so in our lives, then we can ensure that we will not end up useless and unfruitful in our Christian lives. If these qualities and virtues are to increase and to grow, it will imply that the process of character building is to be a continual process; we are to add on to our faith an increasing measure of godliness and all other virtues continually. In 2 Peter 1:10, Peter wrote, "Wherefore the rather, brethren, give diligence to make your calling and election sure: for if ye do these things, ye shall never fall". Here we see another aspect of the practical steps needed. The wholesome outworking of our faith involves practicing all these virtues in our lives daily and in increasing measure. However, it is God who gives the resources and it is He who promises and enables us through the Lord Jesus Christ. All that we need for this outworking are found in God's provision and promises given to us in His Son! (see 2 Peter 1:3-4). So God's calling for us is not something unattainable; it is feasible and He has ensured that we have all the resources and promises necessary to reach our goal. Having said that, it does not mean that the process is going to be easy and painless. In fact, it is a long and painful process involving God's dealings with the direction, desires and state of the heart and the inner being. For God's children to be like the Lord in character and nature, it would mean that all characteristics that are apart from God and contrary to God's ways ought to be removed. The removal of these would involve the willingness to allow God to mould us, to correct us and to deal with ugly and fleshly traits in our lives. And certainly, this can be something very difficult and painful to bear. However, if we make progress in this, it would mean less and less of "I", "me" and "myself", and more and more of "God", "His ways", "His desires" and "His Life". Increasingly, we would become more and more partakers of the divine nature. What is manifested then would be a life of purity, holiness and godliness. In practical terms, what would this involve? Firstly, there should be a willingness to apply and to work out what the Lord reveals to us, whether it be through the Scriptures, through brothers and sisters in the Lord, or through other means which God may be pleased to employ to speak to us. There must be the honesty and openness to accept the truths about ourselves and about deficiencies in our lives. It is only when we act upon what God desires that we make progress in the process of character molding and transformation. Related to this, there must be a preparedness to welcome opportunities to learn various aspects of Christian virtues such as self-control, love and perseverance in the midst of provocative situations. Such situations and pressures should not evoke responses of complaints and grumbling; instead, they should be looked upon as God's opportunities for us to learn to be more like the Lord, provided of course we are clear that the situations are what the Lord has allowed for our lives and development. Together with this, there ought also to be the humility to receive rebuke and correction, as well as the perseverance to carry on, learning long-suffering in this process. When we do fail, we need to repent, to pick ourselves up and to press on and continue in the Lord. We will then see our character slowly but surely being transformed. In the last days, persecution, suffering and pain will increase in varying degrees, and these will be accompanied by physical upheavals and changes in the world. In the face of all these, what can contribute positively to enable God's children not to falter? Here, the one significant factor that must be resolved in the lives of God's children is the issue of COMMITMENT. Commitment to the Lord is vital during such times. It is commitment that will see God's people through, no matter how hard the going might be, whether it be through persecution, pain or suffering. In the midst of uncertainty, dangers and many changes and fluid situations, it is commitment that would make the essential difference. Commitment involves a crisis decision and stand. There ought to be a time in the lives of God's people when they make a definite stand and decision to follow the Lord wholeheartedly and knowingly. By "wholeheartedly", I mean that every aspect of the life is surrendered to God without reservation, knowing full well that we are serving a good and perfect Master who desires the best for us. 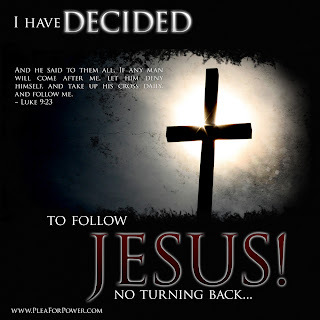 And by "knowingly", I mean having counted the cost and realizing the full implications and consequences of following the Lord and turning our backs to the world, we still make the definite decision and choice in our lives to follow the Lord Jesus. Just as we take a definite step to accept the Lord Jesus as our Savior and become believers, we ought also to take a definite step to commit ourselves totally to our Lord and Master, forsaking all, taking up the cross and following Him. Has there been such a definite crisis and decision in our lives? Or are we still vacillating and not making up our minds, wanting the world and yet wanting the Lord as well? Commitment also implies daily outworking and decisions along the line of our commitment. Although commitment involves a crisis decision, it also involves making small and big choices along the way and perhaps this is the more difficult part of commitment. Many a child of God may well remember the time when he or she made a definite commitment to follow the Lord, whatever it takes, but somewhere along the way, this major decision may have been well forgotten and the daily encounters and choices of life eventually take on a character that it is so very different from what the original commitment meant. Somehow, the implications of the commitment become so faint and the issues of the day loom so large and so urgent that God's children choose and respond like people of the world. The affairs of the world, the business of making a living and the hustle and bustle of life for the busy housewife, the pressured student and the up-and-coming executive - all these seem so real and demanding that the child of God forgets what it means to be committed to God. And so the daily choices are made in favor of what matters most for the moment rather than what means more in the eyes of God. Many a time, the problems we encounter in our Christian life have their roots in the meaning and consistency of our commitment to God. When we say we have no time to read the Bible, it often means we are not prepared to miss our favorite TV program. When we say we cannot afford time to attend a Christian meeting, it often means we are not willing to give up our badminton game for that day or our round of golf or whatever it might be. And so ultimately, it boils down to our priorities, to what really matters most to our lives. In our declaration of our commitment to the Lord, we say that we are willing for Him to be the Lord and Master of our lives. But when it comes to daily outworking, it is an entirely different matter! Here I am reminded of the story of a lady surgeon. She was a pediatric surgeon and worked very long hours. She had to be on call regularly, and at odd hours of the day and night, she might be called upon to operate or to review emergency cases. At the time of her training, when she was busiest and most committed to her work, she became interested in a man, with a view to marriage. Soon she found that her work became affected and before long, she was called up by her superior and questioned about her commitment to her surgical training program. Her answer was, "I have a life of my own to live too." The superior replied, "Go ahead and live your life but drop out of your surgical training program. We require and demand the best, not only of you but also of ourselves." So even in the secular realm, commitment means doing what is required of you, and for the surgeon in training, it means availability at odd hours for operation, emergencies and not being late for ward rounds and medical meetings. She had to make a choice at that point of her life - was she still committed to be a pediatric surgeon? Unfortunately, for many of God's children, commitment to the Lord does not mean daily outworking and choices. We give only bits and pieces to the Lord and carry on as if we were committed. Does not He, who made the eyes, see our state and condition? Wherein is our commitment? Where indeed is our heart? In such a state, it is no wonder then that when persecution or suffering comes along, the child of God easily breaks. In the context of the last days when the degree of persecution and suffering increases, then there is very little room for optimism for many of God's children whose commitment to God remains as a question mark. We can recall the picture of true commitment in the lives of David's mighty men. Against overwhelming odds, in the face of death and danger, they stood their ground and achieved victory. A deeply committed Christian does not easily bend in the face of adversity. Adoniram Judson, a Christian worker to Burma, endured untold hardship to reach the lost for Christ. For seven heartbreaking years he suffered hunger and privation. During this time he was thrown into prison and for seventeen months, he was subjected to almost incredible mistreatment. As a result, for the rest of his life he carried the ugly marks made by the chains and iron shackles. Upon his release, Judson immediately asked for permission to enter another province. The Burmese ruler angrily denied his request saying, "My people are not fools enough to listen to anything a Christian might say but I fear they might be impressed by your scars and turn to your religion." Judson's scars remain as a testimony of his commitment to Christ and the gospel. The great Christian leader, John Wesley, knew the value of having committed men. He said, "Give me one hundred men who fear nothing but sin and desire nothing but God, and I will shake the world." Yes, indeed the church needs committed men and women of God. When the goings get rough and painful, who can we depend upon? Who can God look to, who continues to be faithful and trustworthy? We started by considering what we can do to ensure that we stand in the last days. We saw two areas we can nurture and cultivate - our character and our commitment to the Lord Jesus. A godly and wholesome character can withstand all the negative influences and pull of the world and still remain intact in the Lord. A true and deep commitment to God would remain steadfast and unwavering, despite all the pain, suffering and persecution that might come along. Remember, character and commitment take time to develop. Let us not be discouraged by our failures along the way. Instead, let us make sure that our direction of life is correct and with God's grace and enabling, we will see definite progress in our lives and development.